Developed in the 1950s by legendary investor and IBD founder William J O’Neil, CAN SLIM is a mnemonic for a set of criteria for picking growth stocks with momentum. Unlike other approaches that are distilled to a very simple set of quantitative rules, CAN SLIM is a framework that incorporates both quantitative and qualitative factors, and leaves room for subjective interpretation. That alone doesn’t tell us much. Let’s explore the guidance on each of those subjects and how you can follow through on it in Stock Rover. Does KKD Fit the Bill? The current quarter’s EPS should have grown sharply compared to the same quarter in the previous year, at least 18% Y/Y growth. Several sources suggested 25% as the minimum, with even significantly higher increases being desirable as well. Checking the EPS against cash flow is a good way to ensure that the EPS numbers are high quality. 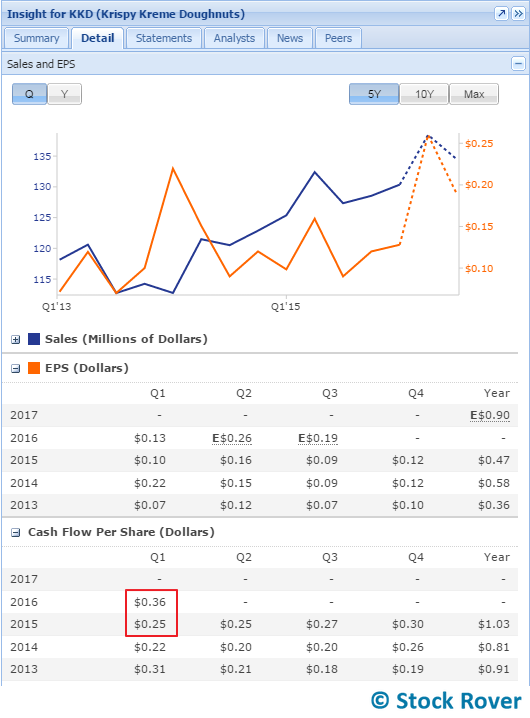 If the EPS growth strongly exceeds cash flow growth, you would want to investigate that difference further. An easy place to check this in Stock Rover is the Sales & EPS section of the Insight panel’s Detail tab, which includes tables of both EPS and cash flow. Select ‘Q’ at the top to compare quarterly earnings YoY. Annual EPS should have increased at an average rate of at least 25% per year over the last 5 years. Like the ‘C’ criterion above, this creates another high quantitative bar to clear. Use the EPS 5-Year Avg (%) metric for this, which you can find in Stock Rover as a column in the Table, or in the Summary tab of the Insight panel (under the Growth subsection). This is the story factor. Basically, does the company give you a good reason to believe it will continue to grow? This requires qualitative research into the company’s news, earnings transcript, and/or 10K. Looking at profitability metrics such as the return on assets, ROIC, and operating margins over time can also provide insight into the quality of the management team. When these top three criteria align (growth + story), institutional investors are attracted, which can facilitate the next set of criteria. As investors demand a limited supply of stock, the price goes up. This basic economic principle suggests that firms with fewer shares outstanding have greater potential for strong price gains. Accordingly, large cap firms with more shares outstanding require higher demand to move the needle, so to speak. O’Neil found that 95% of companies displaying the strongest price gains had fewer than 25 million shares outstanding at the time the gains were realized. This would generally put you in small or mid cap territory (for perspective, no company on the S&P 500 has fewer than 31 million shares outstanding). There is a Shares column in Stock Rover for the diluted number of shares outstanding, as well as a Shares Available (AKA float) column, which provides a more conservative estimate of the supply because it excludes convertible securities and options. Institutional investment is considered an important factor to achieve big price gains because institutions buy in bulk, and often in multiple lots over time, which can have a strong effect on price. Demand from institutional investors plus a limited share supply is a potent combination for large price movements. 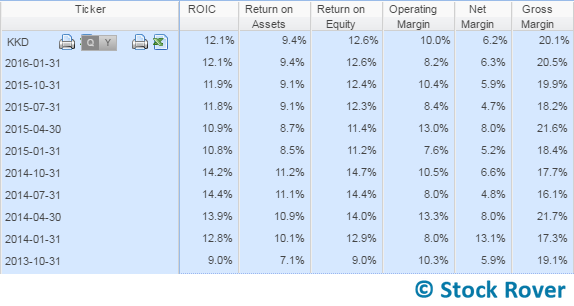 Use the Institutional Ownership % metric to see what percentage of a company’s outstanding shares are owned by institutions, and open the Major Holders window to see the number of different institutional holders (more is better). Note that many institutional investors are restricted to investing in large caps only, but as we’ll see with the example later in this post, small and mid caps can still attract a lot of institutional sponsorship. The takeaway from the ‘S’ criterion is to use the laws of supply and demand to increase your chances of sharp price gains. Be careful with this one, however, because the same laws that can lead to sharp gains can also lead to sharp losses. Is your stock an industry leader, or is it a laggard? Not surprisingly, you want the former. In CAN SLIM, this is actually more of a momentum criterion than a question of fundamentals. The recommendations are for a relative strength index (RSI) of at least 70 and a current price that is within 15% of the 52-week high. These will lead you to momentum stocks that are likely outperforming peers. You can also look for outperforming stocks in outperforming industries using Returns vs. Industry and Returns vs. S&P 500 metrics or charting against the industry and S&P 500. Also known as institutional ownership, this means ownership of a stock by mutual funds, banks, pension funds and other large institutions. As described above, this is an important factor for creating price support and sustained momentum (this page offers more detail on that point). Look for companies that have strong institutional ownership, without being dominated or “over-owned” by them. The precise guidance on how much institutional ownership is desirable varies. A safe bet is to look for a minimum of 10 different institutional owners (a low bar), preferably owners that have a strong performance track record. We did not find an agreed-upon range for institutional ownership as a percentage of total ownership. In the CAN SLIM screener available in the Library, we stipulated a minimum of 35%, with no maximum. 3 out of 4 stocks tend to follow the general market pattern, so you want to be swimming with the current, or running with the herd, as it were, in a bull market. In other words, look to buy on market uptrends. But you want to go a little deeper than that: is the market in a “confirmed uptrend,” an “uptrend under pressure,” or a “market in correction”? A confirmed uptrend is the ideal time to buy, whereas you want to be much more cautious in the latter two scenarios. You can understand market cycles and its macro environment by charting the major indices, following major market news, observing valuation trends, and by consulting the economic indicators reviewed here. If valuations are running high, it might suggest that the market is due for a correction. As you can see, CAN SLIM is more than just a set of quantitative rules—it requires context and research to help you identify what stocks are poised to soar. But notice what’s missing from the CAN SLIM criteria: valuation. The growth and momentum stocks that meet the above criteria could very well be trading at high multiples. However, O’Neil is not concerned about paying a high premium for a stock that meets his criteria. If you are a value investor at heart, CAN SLIM is probably not for you. Although not spelled out in the acronym, O’Neil’s selling philosophy is to sell after achieving 20-25% profit on a stock. You can then compound those gains by investing in another stock on an upward trajectory. O’Neil says, “the secret is to hop off the elevator on one of the floors on the way up and not ride it back down again.” So while you may be leaving some profit on the table by selling a stock before it has reached the end of its run, you are also less likely to hit a downward price correction. And if you follow the CAN SLIM guidance, you would still achieve those gains (in fact, compound them), just on a different stock. There is an exception, called the 8-Week Hold Rule, wherein you hold a stock for at least 8 weeks if it hits its 20% mark in the first 3 weeks. This should only be applied to “true market leaders,” companies with strong fundamentals that meet the CAN SLIM criteria. The rule is designed to help you stay strong through a likely sell-off at some point after the initial sharp gain, on the idea that a leading stock will break through to further gains after the sell-off. O’Neil’s time-tested strategy for compounding profits is very compelling, although it is clear that proper execution requires discipline and vigilance. Additionally, one possible drawback we see to what could be fairly frequent buy-sell cycles with CAN SLIM (compared with buy-and-hold strategies) is the potential to create more gains taxed at the short-term capital gains rate, rather than the lower long-term gains rate. Now let’s attempt to find a stock that passes CAN SLIM muster. First we’ll run a simple screener to find some candidates to meet the baseline quantitative criteria. The screener filters for stocks that have at least 25% average growth in the last 5 years. Quarterly earnings from the most recent quarter (MRQ, above) must be at least 18% higher than that of 4 quarters ago. Institutional ownership must be at least 10% (note that the version of this screener in the Library has a minimum institutional ownership of 35%). The price must be within 15% of its 52-week high. The RSI must be above 69 and the number of shares available must be at least 10 million. While it would be possible to add more filter criteria based on CAN SLIM—for example, capping the number of shares available at 50 million—the screener is already very restrictive. As it is above, the screener only returns 13 stocks. A number of the companies already have institutional ownership at about 99%. Let’s skip those for now on the assumption that they may be over-owned by institutions. A couple of the passing stocks have shares outstanding in the triple digits, so let’s also skip those for the time being. Of the 7 remaining, let’s randomly select Krispy Kreme Doughnuts (KKD) to research, just because it’s a familiar name and a purveyor of delicious treats, plus a quick glance at its numbers suggests positive things. We can see here that the EPS from last quarter (highlighted cell) is 31.4% higher than the quarter 1 year prior. This more than satisfies CAN SLIM. We can see the cash flow growth rate during the same period (boxed in red) actually exceeded the EPS growth. So we’ve got the C and A parts of CAN SLIM covered. Let’s dive into the N: new product, service, or management. Or, what is Krispy Kreme doing to grow? For this I would look at KKD news and analysis, its Investor Relations page, its most recent earnings transcript, and/or its 10K for anything that tells us about its growth strategy. A cursory exploration of these sources tells me that the company is expanding both domestically and abroad by opening new stores, as well as experimenting with promotions and products. Between 2014 and 2015, new leadership was brought in, replacing much of the former management team. We’re seeing positive numbers across the board, with modest growth in most categories in the last 4 quarters or so. This suggests that the new management team has been successful at increasing capital and operating efficiency. For the purpose of this article, let’s say the N has been satisfied by this information. We know that KKD is introducing new stores, new products, and has a relatively new management team, and that so far these seem to be successful. However, if I were to actually invest in this company, I would spend more time digging into sources to determine if the growth strategy and new management team are sound. 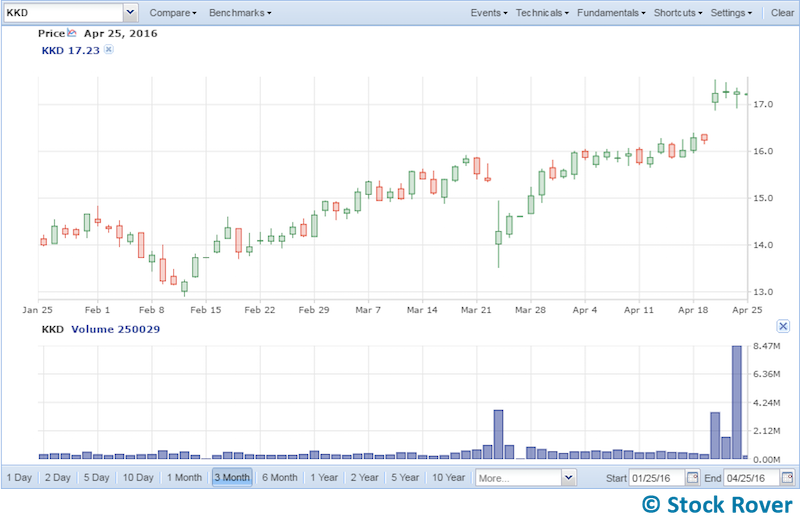 We’re seeing generally higher volumes in the second half of the chart, as the stock has been rising. This is a good sign, suggesting there is support for this stock as its price rises. 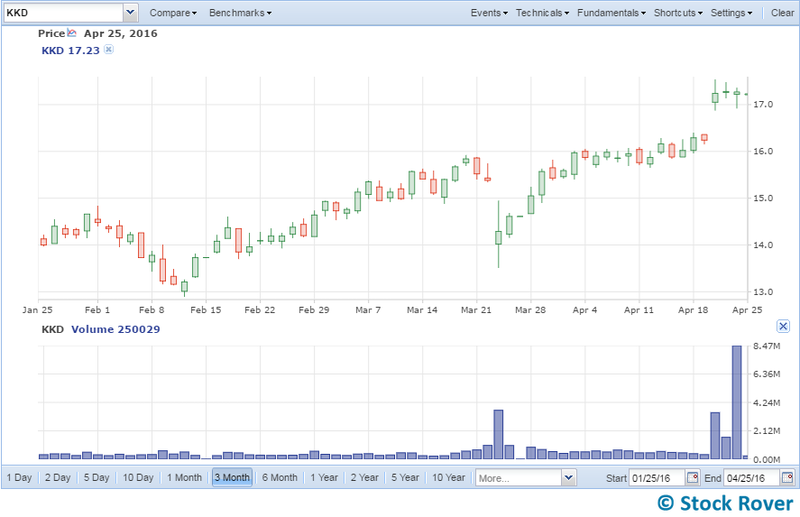 However, between March 28 and April 18, we see the volumes decreasing as the price slowly rises. If the chart were to stop there, we might conclude that the demand is drying up at the higher prices. But then in the last week KKD rallied on the news that it’s being added to the S&P SmallCap 600. This opens up further institutional support for Krispy Kreme as all mutual funds and ETFs that track this index will be adding it to their holdings, thus strengthening the overall demand. L: Is KKD a leader or laggard? 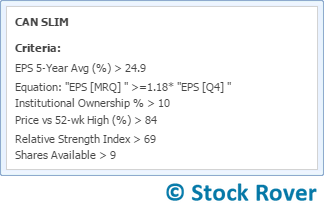 The screener already did most of the work for us on this one, having filtered for companies that at or above 70 on the relative strength index and within 15% of their 52-week high. KKD is at 70.8 on the RSI at the time of writing and at 85.3% of its 52-week high. 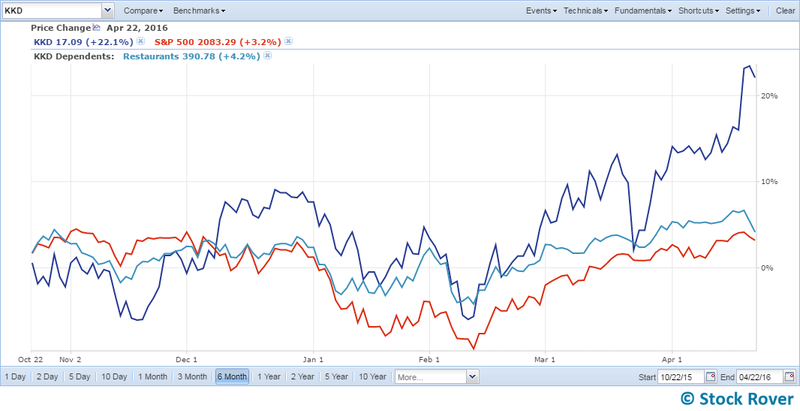 If I compare its returns to its industry and the S&P 500, I see further evidence of leadership. 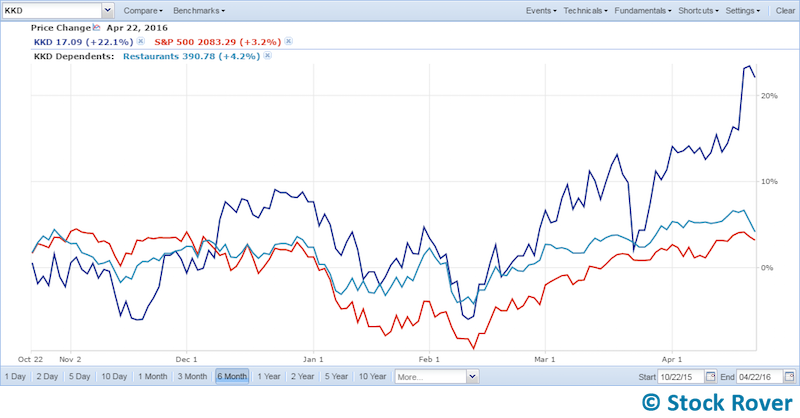 The stock underperformed these benchmarks in a 1-year period, but it has strongly outperformed them in the last few months, as seen in the 6-month chart below. I: Institutional sponsorship. KKD’s shares are 85.3% owned by institutions. 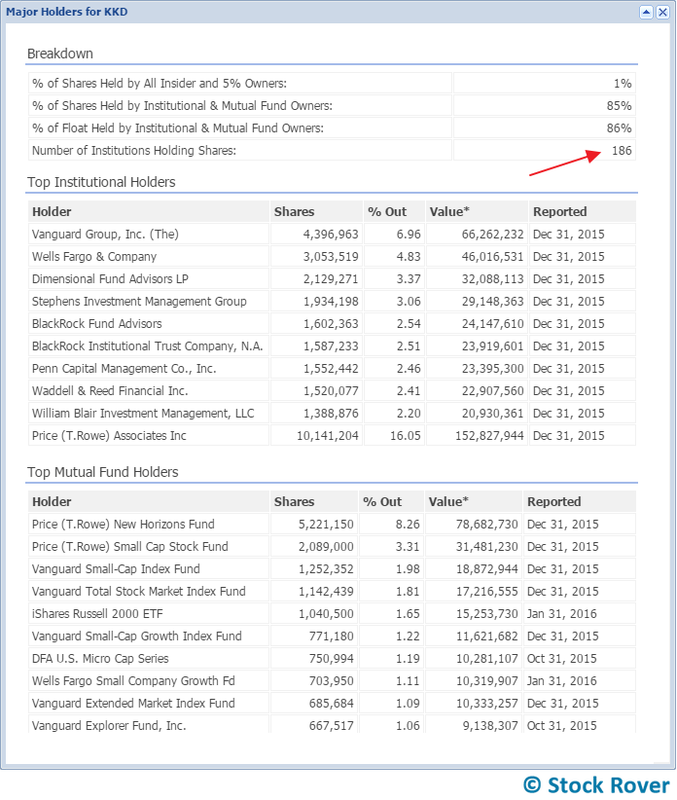 We can see how many, and who the top holders are, by going to the Major Holders window via the Insight panel. The number of institutions is called out below, and the top institutional holders are listed below that. Finally onto M, market direction—many argue this is the most important element of CAN SLIM. What is the market trend? We have clearly been in an uptrend for a couple months, and the SMAs just made a bullish crossover. This is a positive sign for investing according to CAN SLIM. But let’s also take a step back and see whether or not macroeconomic trends are supporting this uptrend or not. This article (which is based on notes that originally accompanied this webinar) provide guidance and links to gain a macro perspective on the economy. Based on current labor statistics, treasury yields, and consumer confidence, the economy appears to be in a solid if slow-growing upward trend, with low probability of recession. The most recent FOMC press release indicates that interest rates will remain unchanged for now and may not be increased until inflation returns to 2%. We are also currently in the favorable half of the presidential cycle (the DJIA tends to perform better in the second half of the 4-year presidential term). All of these suggest favorable conditions for investing. However, we are also approaching the season of “Sell in May and Go Away”—historically, the market performs much better during the November to May period than it does in the May to November period. Additionally, valuations appear to be running high, according to several historical S&P 500 valuation charts. Together these suggest that we should proceed with caution, as the market may be due for a correction soon. 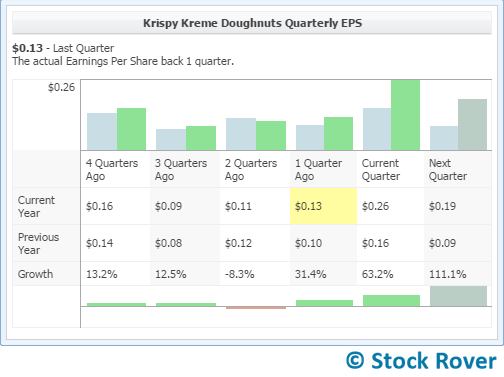 We found Krispy Kreme through a screener that was designed to find stocks with the CAN SLIM level of earnings growth and momentum. In addition to its high earnings growth, the company’s story at a glance and level of institutional sponsorship both support it as a potential CAN SLIM pick. While a week ago it might have been unclear if the supply/demand factor was truly in KKD’s favor, KKD’s recent induction to the S&P SmallCap 600 provides us new confidence in the demand for KKD shares. Market direction is a critical component of the CAN SLIM calculus. The market is in an uptrend, but it may be an uptrend under pressure, meaning that any investment warrants a little extra scrutiny, as most stocks move with the market—so if the market is due for a correction soon, most stocks will succumb. Ultimately, the CAN SLIM process as we’ve interpreted it here does not lead to a simple yea-or-nay decision. Those who feel that the market is still going to rise for some time would probably be more inclined to a yea vote, given that almost all other aspects of KKD fall in line with CAN SLIM (at least assuming that further investigation into the company story adds to its strength). Those who are wary of the market’s high valuation might sit out for a bit longer, even if they feel that KKD as an individual pick is strong. What do you think about the CAN SLIM framework? Have you tried it and met success? Isn’t O’Neil the same person who encourages investors who read IBD to place an 8% stop loss order on the stocks that are bought? Good article! My problem in using CAN SLIM is that by the time I find a qualified stock, it is too far gone for any kind of reasonable entry. And I prefer to use a Trailing Stop to an absolute stop of 20-25% gain.